john4jack (Corvallis, Oregon, United States) on 12 August 2009 in Miscellaneous and Portfolio. BLACK AND WHITE CONVERSIONS - Many of us were drawn to photography because of the incredible artistic beauty of black and white photographs. For that reason alone, we often want to convert our photographs to monochrome. In the digital world, there are an amazing number of ways to make these conversions. What I have come to understand is that making good black and white conversions is more complex and more sophisticated than working in color. Others may disagree, but that certainly has been my experience. Almost all of my B&W conversions use Nik's Silver Efex Pro. In my journey, I have come across two terrific resources. One is Vincent Versace's new DVD tutorials, "Return to Oz; Oz to Kansas 2.0." Versace has blown my mind when it comes to B&W conversions. 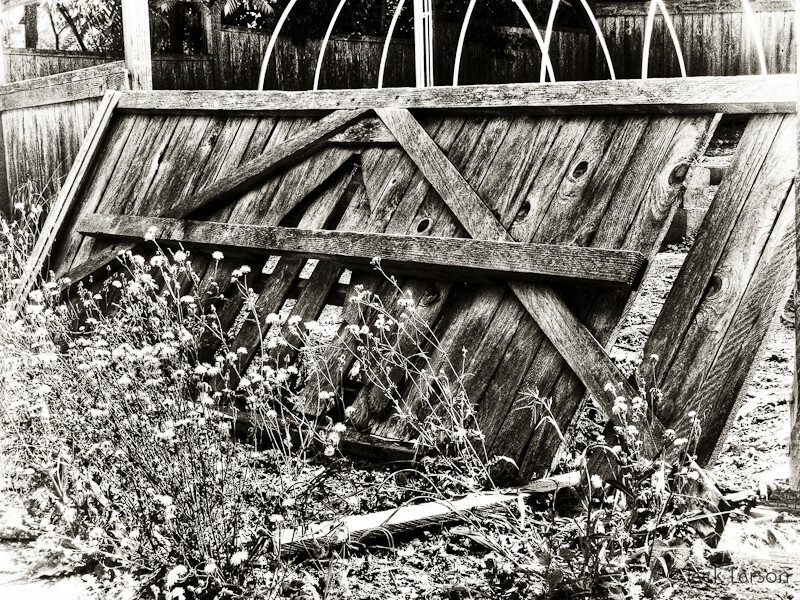 The other resource is Jason Odell's "The Photographer's Guide to Silver Efex Pro." Playing around has been worthwhile! I'm a fan of b/w pictures. I like the silvery almost eerie effect, here. You get a lot of 'mileage' out of Circle Trail, photographically speaking, don't you! @Dulcie: Yep on the Circle Tr. mileage. I love the final result. Lovely texture on those woods. That's a nice mono picture Jack. Like its sharpness. The final result was most definitely worth all the 'effort'! @Lorraine: Whoa! What a nice comment! @MJ: I'm working very hard on learning how to do B&W conversions well. I'm finding it harder than color. Absolutely mesmerizing! This is a seemingly simple composition, but I find myself lost in all the different tones here! You have outdone yourself with this one! And thanks for the info, too. What great resources! Wow ..I like this treatment ,the texture ,sharpness of this photo ,a beautiful composition ! Nicely done. Your processing workflow sounds similar to mine somedays. Quite the involved process to get this fine shot. I like the final result very much. Excellent work. Love that Nik stuff. I'd be lost without dfine as I often shoot at high ISO. Nice composition, contrast etc. Well done. Well worth the effort on the processing Jack. Will have to start saving up to buy this software. Looks great! I agree about Silver Efex; I like it. Stunning. The processing and conversion are out of this world. Great job on the composition as well. @khadi: Thank you very much. Good resources, Jack, thanks! This is an excellent conversion to greyscale. I usually do all of my tweaks in color to get the shot how I want it to look, then I convert to greyscale and do the finally tweaks. Works for me, but yes, it is a bit difficult to get the hang of the process at first..
@Toni: I also work first in color to get it the way that I would like it in color; then I do my conversion. Excellent treatment. It really brings out the texture and tones of the wood. This was the shot to apply it to. I like your commentary on B&W. I dabble but wish to do more and agree that a really good B&W can be more complex. I look at B&W as having more artistic value which relates to my early days of working with pen and ink sketching. This image really captivates me. @Barbara: Thanks, Barb. B&W is a primary focus of my learning these days.